This is 2 Reales minted in Spanish Colony of Bolivia. The Krause catalog number is not yet confirmed, either KM#8 or KM#14 (Krause Standard Catalog of World Coins 1601-1700 (2009) 4th Edition, page 145) and mintage year between 1605 to 1622. Bought from a seller based in Sumatra, Indonesia which he claims that the coin was found on a river bed of once busy entrepot on that island. More information about the cob is definitely required. If this sample is indeed from Bolivia, then the short article should complement it. Provenance: From the Robert H. Gore, Jr. Numismatic Collection. As additional silver deposits were discovered in the colonial territories there was a pressing demand to export it to Spain as quickly as possible. To do this, starting in the reign of Philip II, the mints produced irregular coinage called cobs. Rather than rolling out a bar of silver into a sheet of a specific thickness that could then be cut into smooth round planchets which would be stamped into coins, a faster method was employed. A bar of silver (see examples of gold bars in our Spanish gold listings) was simply cut into chunks of the appropriate weight. These small sliver clumps were then treated as if they were finished planchets and were hammer struck between crude dies. In fact, the Spanish word "cabo" (from which the English "cob" is derived) refers to the end; in this instance, the clump of silver clipped off the end of the bar. The size, shape and impression of these cobs was highly irregular but they were the proper weight. Many cobs were quite thick and disfigured with large cracks. Also, these uneven clumps made poor planchets so that frequently only a small portion of the image on the die was impressed on the silver. If a cob was overweight the minter simply clipped a piece off, further disfiguring the coin. During the seventeenth century a few full sized finished coins called "royal or presentation strikes" by present day collectors were also produced but it was only the crude cob that was mass produced. The intention in minting these crude but accurately weighed cobs was to produce an easily portable product that could be sent to Spain. In Spain the cobs would be melted down to produce silver jewelry, coins, bars and other items. Cobs also circulated as coinage, many cobs made their way to the English colonies where they were used both as coins in commerce and hoarded as specie. As the cobs were crudely produced it was quite easy for colonials to clip off some silver and then pass the coin off at full value. Also, because of their crude design it was easy to make lightweight counterfeit cobs using the clipped silver. Many clipped and lightweight Spanish cobs were melted down in Boston to make the Massachusetts silver coinage. Cobs were produced in denominations of one, two, four and eight reales under Philip II (1556-1598) and Philip III (1598-1621). A half real cob was added under Philip IV (1621-1665). Cobs continued to be produced through the reigns of Charles II (1665-1700), Philip V (1700-1724 and 1725-1746), Louis I (1725), Ferdinand VI (1746-1759) and Charles III (1759-1788). 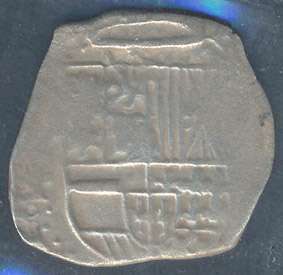 The obverse of a cob displays the crowned Hapsburg shield with the mintmark and assayer initial to the left and the denomination to the right of the shield. The legend, although frequently missing from the planchet, is some variation of the name of the king with DEI GRATIA (By the Grace of God). The reverse displays the arms of Castile and Leon within a quatrefoil design. The arms are similar to those on the Charles and Johanna pre cob silver coins but the two intersecting lines, dividing the shield into quadrants, are emphasized so that they represent a cross in the center of the shield with the castle and lion images in their respective corners. The legend is some form of REX HISPANIARUM ET INDIARUM (Of the Spains and the Indies - as found in the pre cobs). 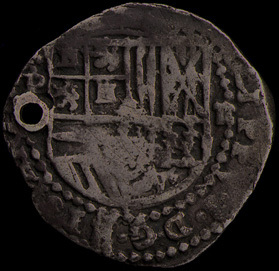 Starting in the seventeenth century most cobs were dated but this information was added to the obverse legend and was usually not picked up in the stamping of the coin. Dating and locating a cob can be difficult. If an assayer's initials are present and the mint is known then some dating parameters may be determined, as the dates of appointment are available for many assayers. Also, particular details on the obverse shield differ for each ruler so some examples without other clues can often be dated to a specific king, if the shield is distinct. If the mintmark is missing the reverse cross may assist in identifying the mint. A Jerusalem cross with a ball at each extremity denotes the Mexico mint. A variety of other specific details may assist in making attributions; consultation of regional studies may allow one to narrow the possibilities, especially if a coin can be assigned to a specific time period. For example, E.A. 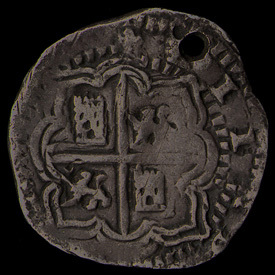 Sellschopp has identified the lion and castle punches used on the reverse cross shields of 8 reales from the Lima, La Plata and Potosi mints during the period 1568-1651. After uncovering the second Potosí scandal the Hapsburg shield cobs were retired at the Peruvian mints, namely at Potosí, Santa Fe de Bogotá and Lima. Too many individuals refused to accept these coins, suspecting they were receiving debased products. However, the shield cobs continued to be produced in Mexico as they did not have a problem with debased coinage. But in the Viceroyalty of Peru a new design was issued in 1652. 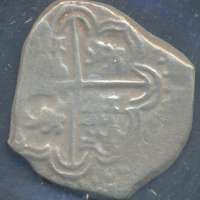 The obverse was similar to the earlier cob reverse, consisting of a cross that incorporated the heraldic symbols of Leon and Castile. The new reverse was based on the design used for the pre cob coins, that is, depicting the Straits of Gibraltar with the Pillars of Hercules. The two vertical pillars intersected three horizontal lines of text, giving the overall appearance of what is frequently called the "tic-tac-toe" design. The top line of text included the mintmark, the denomination and the assayer's initial, for example L 8 M (Lima, 8 reales, assayer M). The second line contained P V A or some other combination of letters from the legend PLVS VLTRA (More Beyond), with the large eight reales coin containing the entire legend. The final line gave the assayer initial, last two numerals of the date and then the mintmark, for example M 88 L (assayer M, 1688, Lima). Since these coins were produced from 1652-1773 it is sometimes necessary to identify the assayer to be confident of the correct century. As these coins were easily distinguished from the greatly debased earlier cobs they were generally accepted as a suitable replacement and helped to stabilize the economy. However, even with the new regulations, as long as the assayer's office was auctioned to the highest bidder, some debasement of the Peruvian coinage continued throughout the cob period.